A checked version of this page, approved on 25 September 2017, was based on this revision. Linear features are imaged best on displays of anomaly gradients, such as (P947885)(Key: (P948103)) and (P947886). Terrane boundaries, major faults, dykes and other steep-sided intrusions can often be recognised on these plots and may be traced beneath younger cover rocks. The strongest gradients red on (P947885) and (P947886)(Key: (P948103)) are associated with major basin-bounding faults or where the density and magnetic contrasts are greatest. Many other linear features that do not coincide with known structures can also be recognised. 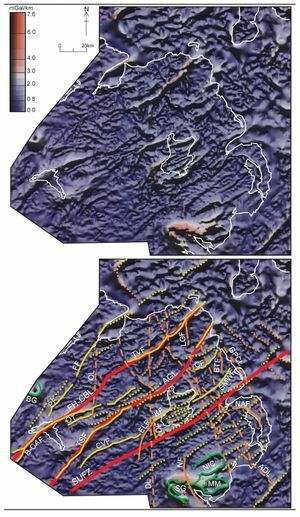 For clarity, in (P947885) and (P947886)(Key: (P948103)), not all known geophysical lineaments are indicated. The number and nature of basement suspect terranes in Northern Ireland, and their boundaries, is still a controversial issue (see Basement structure and the terrane model article) (14–17). 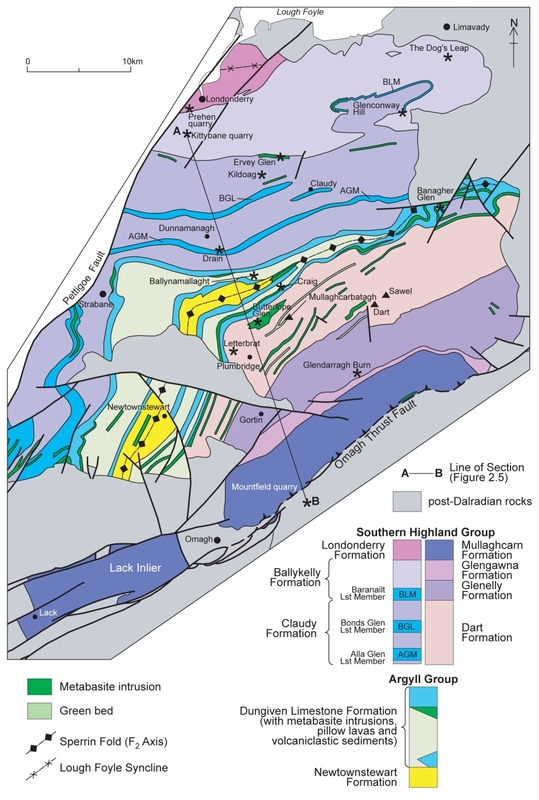 The Central Highlands (Grampian), Midland Valley and Southern Uplands-Down-Longford terranes are all recognised geophysically (see Central Highlands (Grampian) Terrane - metamorphic basement, Midland Valley Terrane, Southern Uplands-Down-Longford Terrane articles). The boundaries between these terranes in Scotland are the Highland Boundary Fault and the Southern Upland Fault respectively. In Northern Ireland the Southern Upland Fault is concealed but the geophysical signature associated with the Ballantrae Complex on the north side of the fault trace can be recognised. The Highland Boundary Fault (HBF), which in western Scotland may act as a double terrane boundary between the Midland Valley and the Highland Border and Central Highland (Grampian) terranes, cannot be traced with any certainty west of Arran and its character almost certainly changes as it continues into Northern Ireland. The trace was originally located south of the inlier of Dalradian rocks in northeast Co. Antrim. As on the east coast of Scotland at Stonehaven, the Dalradian is overlain in northeast Co. Antrim by conglomerates, putatively of Devonian age. However, if the HBF is located south of the northeast Co. Antrim Dalradian inlier then it does not have a distinctive geophysical signature commonly associated with major crustal features. Gravity anomalies across the Dalradian-Devonian contact at Cushendun are more easily reconciled with an unconformity, or a stepped, normal fault zone than with a single, steeply inclined, normal fault zone comparable to the HBF in Scotland. Therefore a magnetic lineament, the Fair Head-Clew Bay Line (FH-CBL), was subsequently proposed as the continuation of the HBF into Ireland . In this model Dalradian rocks lying to the south of the FH-CBL, in northeast Co. Antrim and the Sperrin Mountains, are considered to be thrust southeastwards over rocks of the Midland Valley Terrane. At the southern limit of the Dalradian outcrop in the Sperrin Mountains the Omagh Thrust Fault is the surface expression of a ramp zone that dips northwest to join the steeper FH-CBL structure at depth . This model also places the surface trace of the HBF southeast of the FH–CBL, along the Omagh Thrust Fault and continuing northeastwards on the south side of the concealed Highland Border Ridge to the coast of Co. Antrim near Cushendun. There is no evidence that the Dalradian inlier in northeast Co. Antrim is an overthrust slice and therefore the terrane boundary at depth may also lie southeast of the inlier, rather than along the Tow Valley Fault. 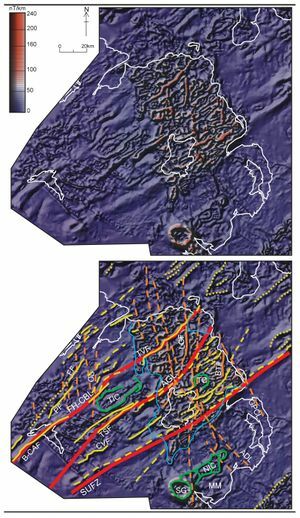 The magnetic anomalies between the Omagh Thrust Fault and FH-CBL (MD5b), believed to represent concealed Tyrone Igneous Complex, are very similar to anomalies from Dalradian rocks northwest of the FH-CBL between Castlefinn and Stranorlar in Co. Donegal (MD2). Indeed, the gravity anomaly between the Omagh Thrust Fault and the FH-CBL shows no evidence of an extension of the high-density basic rocks of Tyrone Igneous Complex beneath the Mullaghcarn Formation ( (P948093)). In contrast, to the southwest, the northwest flank of the Dromore High may indicate basic rocks at depth beneath the Dalradian rocks of the Lack Inlier. The recognition of the FH-CBL as the extension of the HBF into Ireland is problematical , . In an attempt to reconcile the difficulties the Antrim-Galway Line (AGL) was proposed as the boundary between a ‘Northwestern terrane’ and the Midland Valley Terrane. The former terrane lies between the Central Highlands (Grampian) and Midland Valley terranes and includes the ‘Highland Border Ridge’ and the Tyrone Igneous Complex, with the FH-CBL and the AGL as its terrane boundaries. The concealed (AGL) lineament trends from Cushendun in Co. Antrim southwestwards through the Tyrone Igneous Complex, appearing at the surface as the Tempo-Sixmilecross Fault from north of the Pomeroy Inlier (see Midland Valley Terrane article) through the Fintona Block to Galway on the west coast of Ireland. This model proposes that the AGL was the line along which the Midland Valley Terrane docked with a ‘Northwestern terrane’, by sinistral movement, while in Scotland this occurred along the HBF. However, because the magnetic lineament corresponding to the AGL is difficult to trace across the Antrim Plateau the originally defined surface trace of the Highland Boundary Fault is taken here as the demonstrable terrane boundary between the Central Highlands (Grampian) and Midland Valley terranes. The complex patterns of magnetic anomalies in the northern part of the Midland Valley Terrane in Northern Ireland may reflect the composite nature of this terrane. ↑ Max, M D, and Riddihough, R P. 1975. The continuation of the Highland Boundary Fault in Ireland. Geology, 3, 206–10. ↑ Hutton, D H W. 1987. Strike-slip terranes and a model for the British and Irish Caledonides. Geological Magazine, 124, 405–25. ↑ Murphy, F C, Anderson, T B, Daly, J S, Gallagher, V, Graham, J R, Harper, D A T, Johnston, J D, Kennan, P S, Kennedy, M J, Long, C B, Morris, J H, O'Keefe, W G, Parkes, M, Ryan, P D, Sloan, R J, Stillman, C J, Tietzsch-Tyler, D, Todd, S P, and Wrafter, J P. 1991. An appraisal of Caledonian suspect terranes in Ireland. Irish Journal of Earth Sciences, 11, 11–42. ↑ Ryan, P D, Soper, N J, Snyder, D B, England, R W, and Hutton, D H W. 1995. The Antrim-Galway Line: a resolution of the Highland Border Fault enigma of the Caledonides of Britain and Ireland. Geological Magazine, 132, 171–84. This page was last modified on 25 April 2019, at 05:52.